The benefits of amber aromatherapy and how to use natural baltic amber for your health. Amber ( Succinum) has a long and proven history of being a valuable natural medicine that has been used to cure many ills. They also found that the vapors from burned amber repells flies, mosquitos and other insects. The Prussian Priest Matthaus Praetorius recorded that in 1680, "During the plague not a single amberman from Gdansk, Klaipeda, Konigsberg or Liepaja died of the disease"
Even today aroma therapists use Amber smoke to cure people of a wide range of ills and to revive energy. They even use amber to fumigate their homes. And now that modern science has recognized the importance of the active ingredient in amber, succinic acid, they are producing it commercially. Succinic acid is the active ingredient in Pure Natural Baltic amber. Pure, natural Baltic Amber contains about 8% succinic acid that is released to the air when amber is heated or burned. And there are different mechanisms that you can use to get the Amber vapors to the air. You can use a standard aromatherapy burner and add to that Amber powder, Amber chips, or Amber oil. Amber chips are the choice here because of their low cost and availability as compared to amber powder and amber oil. The oil is in high demand for skin applications and powder is used in amber creams and reprocessed amber. 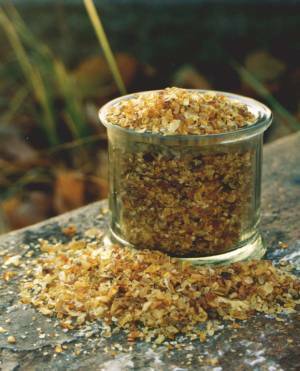 As a note, you can make your own powder from amber chips. See Amber Powder. And you can get a supply of amber chips at Amber Chips. You can also burn Amber sticks. Many people prefer in the Amber sticks because they are portable and light and you can take them with you when you travel so that you can add the pleasant and protective aroma of Amber incense to your room wherever you are. Amber sticks are made of natural baltic amber powder held together with natural resin. The burn for more than an hour and fill your room with pleasant, protective amber vapors. You can get a supply of amber incense sticks at this link. Amber Incense Sticks. You might consider using amber chips at home in an aromatherpay burner and amber sticks when you travel. To get you started, there is an amber aromatherapy kit here. It is important to note that this information applies only to Amber from the Baltic regions of Europe. That is because the active medicinal ingredient in Amber is succinic acid - hence the medieval name for amber as succinium. Natural Baltic Amber contains the highest concentration of succinic acid and that is why it is chosen by Chinese medicine makers in spite of its comparatively high price relative to cheap Chinese ambers and ambers from other parts of the world. Know your supplier! The supplier recommend by us deals only in natural baltic amber products.